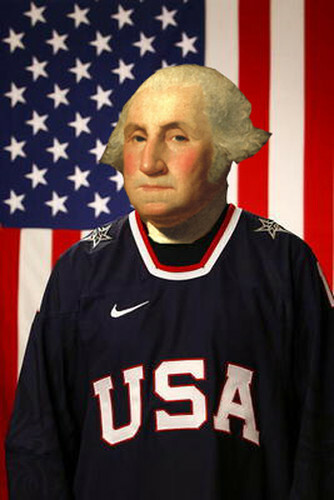 With today being President's Day in the United States, we felt it was an appropriate time to take a look at hockey teams named Presidents. 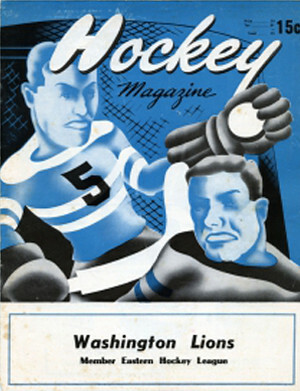 The first such team actually began life as the Washington Lions of the Eastern Hockey League in the 1951-52 season, replacing a previous American Hockey League team of the same name who left Washington DC after the 1948-49 season. 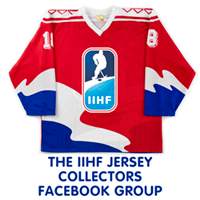 The EHL Lions had a extremely tough time their first season, withdrawing from the league due to poor attendance on January 15, 1952 after 36 of a scheduled 68 games with a 9-24-3 record. 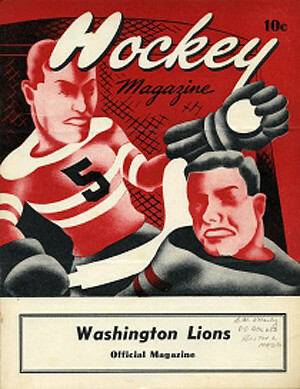 The Lions returned to try again in 1952-53 and not only played the entire season, but were able to make the playoffs after finishing fourth out of five with a 26-31-3 record which was followed by a first round playoff exit. 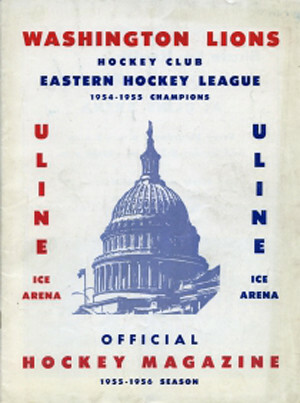 Down to just five teams in 1952-53, the entire EHL did not operate during the 1953-54 season. 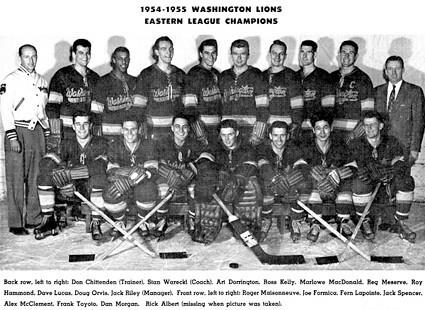 When the league returned in 1954-55, Washington finished first overall with a 26-21-2 record and then defeated the New Haven Blades 3-1 before sweeping the Baltimore Clippers in four to win the EHL championship. They finished mid-pack in 1955-56 at 33-28-3 and were led by Fern Lapointe's 92 points but were a first round playoff exit. The Lions plummeted to last place in 1956-57, winning just 18 times out of 64 tries. 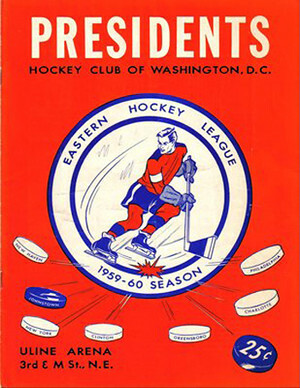 For the 1957-58 season, the club changed its name to the Washington Presidents. They were led in scoring by Wally Kullman, the only player on the team to average more than a point per game with 26 goals and 63 points, playing in 60 of the team's 64 games. The club finished second in the regular season with a 38-24-4 record for 76 points, just one back of the Charlotte Clippers. They defeated the Johnstown Jets 4-2 and then outlasted the Clippers in a full seven game final to win the 1958 EHL championship after their first season as the Presidents. Kullman again led the team in 1958-59, only in much more dominant fashion, with 41 goals and 56 assists for 97 points, far ahead of his next closest teammate with 69. While Kullman's 97 points were good for third in the league, the team finished fifth out of six and out of the playoffs at 29-35. 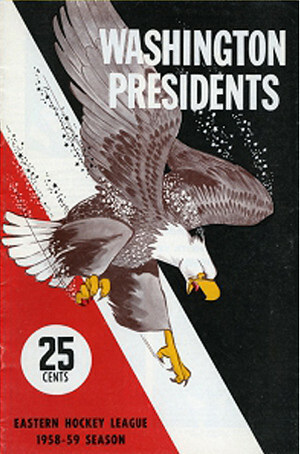 The 1959-60 Presidents were led by Ken Davies' 65 points and Dan Patrick's 64. The team once again missed the playoffs after finishing last in the Southern Division with 25 wins, 35 losses and 5 ties. This would prove to be the final season of the Presidents, as the club folded after eight seasons due to financial difficulties. 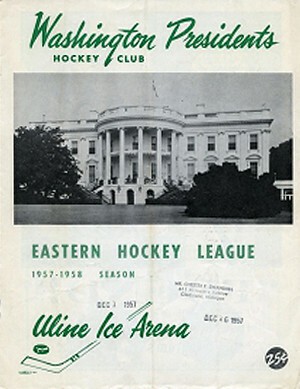 Washington D.C. would be without hockey for 14 seasons until the arrival of the Washington Capitals of the NHL for the 1974-75 season. 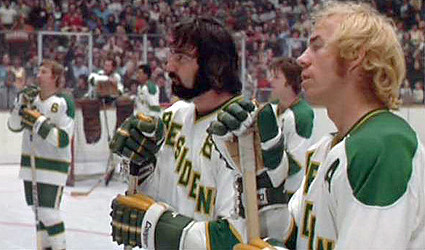 The best known team to be called the Presidents would be the Hyannisport Presidents of the fictional Federal League from the 1977 movie Slap Shot starring Paul Newman. 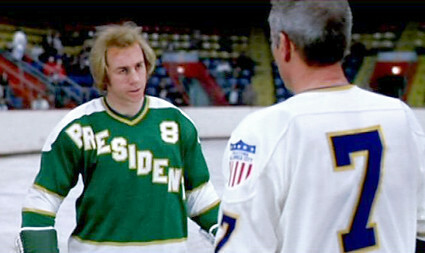 The Presidents appear in the movie's first game action, where center Nick Brophy confesses to the Charlestown Chiefs player/coach Reg Dunlop that he is drunk, his wife left him and "if anyone throws me against the boards, I'm going to piss all over myself." Once the Chiefs players realize Brophy is plastered, the Chiefs leading scorer Ned Braden, checks him into the boards and warns him to "Get off the ice. You're going to kill yourself." Brophy, having been checked, does indeed wet himself and slinks off the ice, hoping no one has noticed his predicament. Later in the film, with the Chiefs playing much better having added the notorious Hanson Brothers to the roster, travel to Hyannisport. An incensed Presidents fan hurls a set of keys at Jeff Hanson, which prompts the brothers to invade the stands, looking for retaliation as the Presidents look on. A melee breaks out as the most of the Chiefs follow close behind. In the end, the Hanson's need to be bailed out of the Hyannisport jail before the Chiefs can return home to Charlestown. Of note, the actual Hyannis Port, Massachusetts is two words, but in the film, the team is referred to as the single word "Hyannisport" on scoreboards and the town's welcome sign in the film. 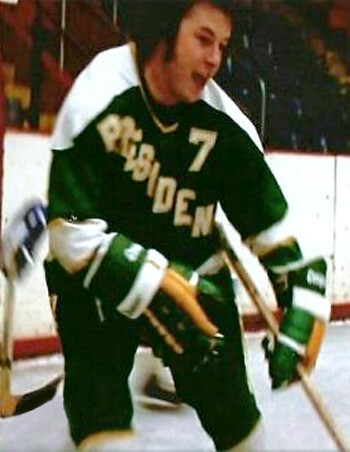 Perhaps the most famous Presidents' alumni is #7 Bruce Boudreau, who was with the real life Johnstown Jets at the time of the filming of Slap Shot. 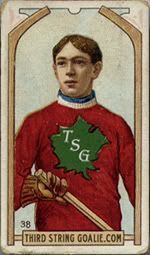 Cast as one of the Presidents in the movie, he would later go on to play 30 games in the WHA, 141 in the NHL, 30 in Germany, 145 in the CHL, 240 in the IHL and 634 in the AHL scoring 574 goals. 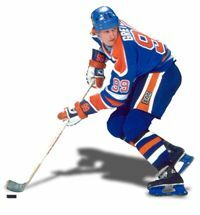 He would later go on to become head coach of the Washington Capitals, Anaheim Ducks and currently the Minnesota Wild. 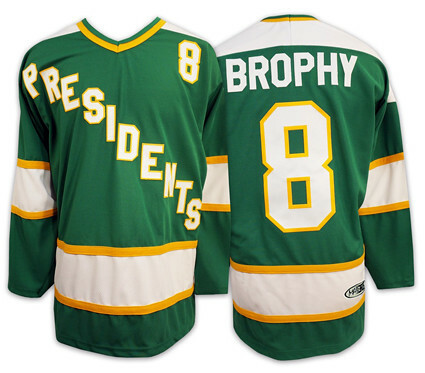 Today's featured jersey is a 1976-77 Hyannisport Presidents Nick Brophy jersey. 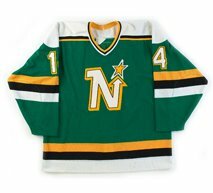 The Presidents jerseys may look familiar to those with a keen eye for history, as the striping template and coloring for their jerseys is that used by the Minnesota North Stars from 1968-69 through 1974-75. 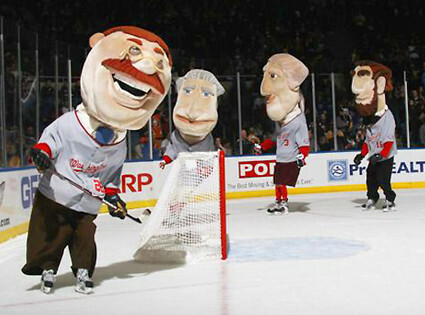 Also in honor of President's Day, a few extra photos of Presidents enjoying their hockey! 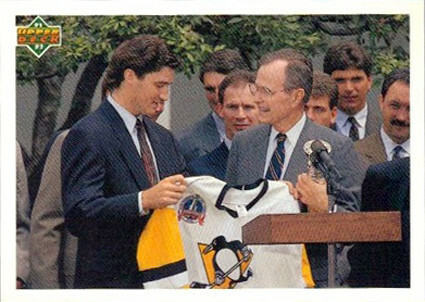 The annual tradition of the NHL Stanley Cup champion visiting the White House began in 1991 when Mario Lemieux and the Pittsburgh Penguins met with George H. W. Bush, which even merited its own hockey card from Upper Deck. Here is a fun article about the Stanley Cup's most memorable White House moments. In today's video section, President Obama welcomes the Pittsburgh Penguins, the eighth and final team he hosted at the White House, which included several humorous moments and plenty of impressive hockey insights. Hi - love your website. However, I must take issue with your comment regarding the Stanley Champion visit to the White House. 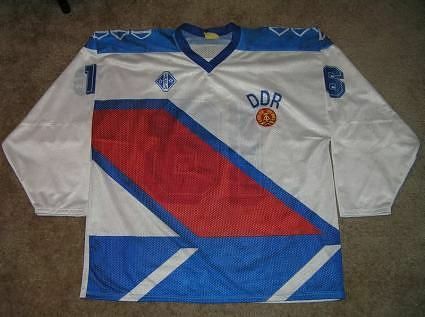 You incorrectly note that the Pittsburgh Penguins were the first to do this, in 1991. In fact it was the 1983 New York Islanders who did this first. They were invited by sitting President Ronald Reagan after winning their fourth Cup in a row and becoming the greatest American based NHL dynasty. The team met the President and presented him with a goalie stick that said "the puck stops here" on the blade. You can easily see evidence of this visit by looking at the cover of the 1983-84 New York Islanders Media Guide. The cover features the event with Ronald Reagan greeting Islanders John Tonelli, Bryan Trottier, Billy Smith and captain Denis Potvin.